Liz's Paper Loft: MCT December Sale ~ build a fall wreath! MCT December Sale ~ build a fall wreath! Hello My Creative Friends! This week at My Creative Time is going to be a little different from our “normal” release week! We will be sneak peeking a new set, but not until Thursday! :) Monday - Wednesday this week we are all showcasing OVERSTOCK products that will be offered at a discount price starting this Friday, December 15, 2017 at 8am PST! We are making room for the new year & I thought it would be nice to showcase the sets that we are marking down Mon-Wed so this can give you time to check YOUR inventory to see if you have it or not! This way on Friday, you will know exactly what you want OR what has been on your wish list! Today I am showcasing Build A Fall Wreath! Here are a couple of projects I created with this set. For information on how to create this card click HERE. Be sure to see what my Design Teammates showcased. I am looking for designers who are enthusiastic & have a passion for what we all LOVE to do....."CRAFT"! 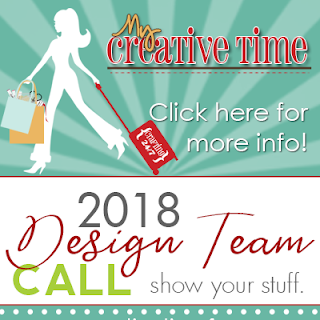 I am also looking for positive & outgoing designers who LOVE to create with My Creative Time products! If you are not familiar with my products, you can see them HERE. I have to choose a select amount of designers to showcase my products and really bring out their best features. ~You will need to have an active blog & also be able to share your MCT creations not only on your blog but on facebook or any social media....etc~! ~The deadline for you to submit your entry is December 22, 2017 at midnight PST! ~ Please include in your email, your blog address & a current list of DT's you are on. ~ Please attach 3 projects: (1) card, (1) Tag (1) 3-D project. ~ If you have any MCT products, I would LOVE for you to showcase them, if not, just use what you have! If you are selected, you will be contacted by email and the new design team will be announced in January 2018! Oh Miss Liz....I DO remember these...sooooo super Adorable and sa-weet...lovin' the trip down the My Creative Time Memory lane....hmmm what comes to mind.....I love it more today than yesterday....but not as much as tomorrow...hey too corny....LOL Always Brilliant and Creative you are!! YOU SO ROCK!! Beautiful card!! I love that stamp and die set!! The leaves in this set are so pretty...I love how you arranged them! MCT December Release Blog Hop ~ flurry of love! MCT December Release Sneak Peak ~ snow girl! MCT December Sale ~ believe in your dreams!